In July 2008, I met my friend Matt off the Bucharest-Sibiu train to embark on the 35th leg of his round the world walk. The retelling of Matt’s walk would make for a book in its own right, but just for now I’ll supply the bare bones. Matt first set out from his house in Finsbury Park in November 1989, shortly before the edifice of East European Communism tumbled dustily down. Accompanied by his cousin Guy, who has subsequently walked some 20 stages, and a couple of other friends, they got as far as Sevenoaks in Kent. Subsequent stages took them to Dover, through northern France, across the southwestern tip of Germany, through Austria, Slovenia, and Hungary and then into Romania. A cast of twenty or so friends have accompanied Matt on various stages and I myself am a veteran of ten. I usually try to cherry-pick the mountain stages and avoid those long slogs over the plains. Stages of the walk have varied in length from a day to two weeks or so with one or two stages walked each year. The aim of the walk is not to circumnavigate the globe by the most practicably direct route (or at all, in truth! ), but rather to steer an easily distracted course through the most interesting and agreeable landscapes on offer. So, it’s nearly twenty years since Matt first set off and the joke is that he’ll be 376 years old by the time he crosses the Seven Sisters Road again. The last stage of the walk saw Matt and I largely thwarted after attempting to traverse a 2000 metre-plus ridge in the Romanian Carpathians in the depths of Winter. We had our snowshoes, but above 1900 metres or so we really needed crampons and ice axes, which we’d not brought. So, six months later we found ourselves speeding by taxi to the small Transylvanian village of Dejani, scene of our earlier capitulation. The road was so pot-holed it looked like a tarmac emmental, but our driver hurtled along unperturbed with some rather lachrymose Romanian folk music issuing from the car stereo. Heavy rain had been a theme of recent days and the inundated switch-backed mountain track would have thwarted most 4-wheel drives, but our driver heroically bludgeoned his way onwards surely destroying his means of income in the process. 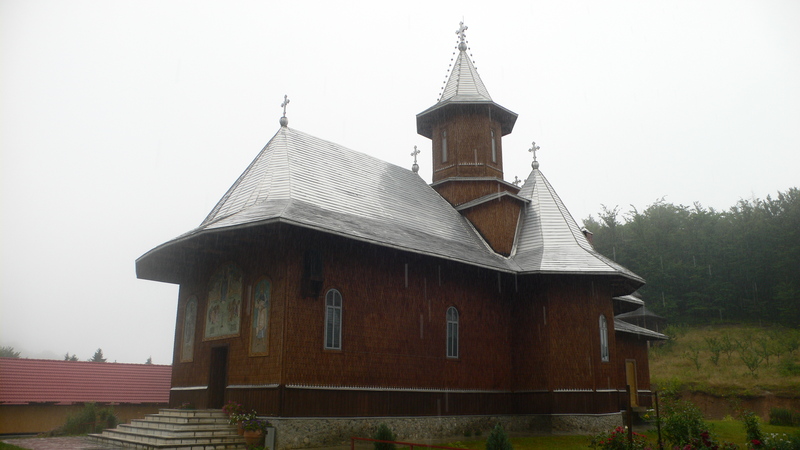 The downpour continued as we left our taxi at the Dejani Monastery, having extravagantly tipped our proud driver. We took shelter in an alcove in the monastery walls and brewed tea on the trangia stove as a couple of bearded, ascetic-looking monks tinkered with a tractor nearby. By and by, the rain pretended to stop for ten minutes, luring us into the open so it could soak us with renewed vigour. We squelched our way upwards into forest and wriggled around looking for the main path that followed the ridge ever upwards to the spine of the Munţii Făgăraş (pronounced fuh-guh-rash). On the moist and murky tree-cloaked hillside, a number of viable-looking tracks solicited for custom, although none of them seemed to do quite what we wanted; so we beat a path directly uphill and picked up the ridge path amidst the storm-shattered remnants of trees that had still stood when we passed this way some months before. The rain continued, only varying in its intensity, as we followed the path that we’d previously traversed in snowshoes. We were both pretty wet and decided that we’d aim for a shepherds’ bivouac site that we’d passed on the Winter walk. Having agreed on an objective, we set about trying to enjoy the rest of the walk. 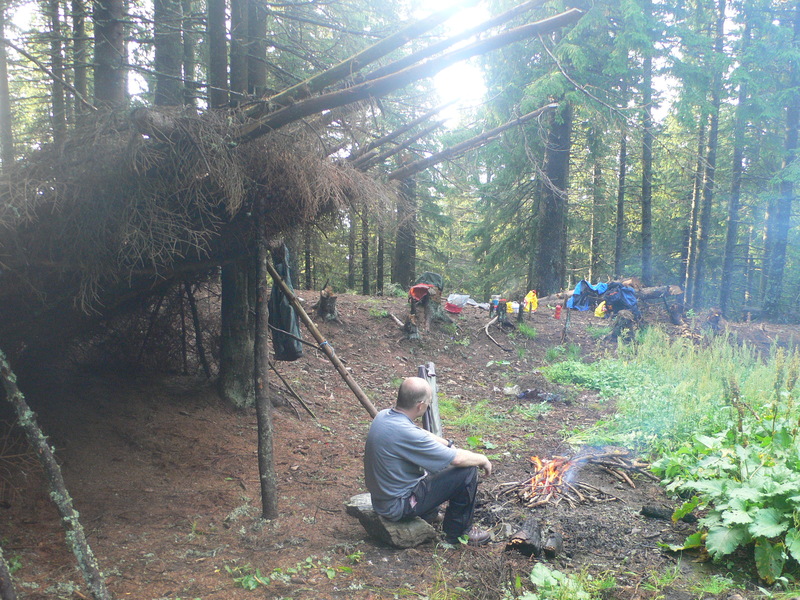 Soon enough we arrived at the bivouac, at about 1600 metres, which featured a lean-to shelter constructed from a few slim pine tree trunks and roofed with pine-needled fronds. Unexpectedly, the rain stopped and we set about collecting water and drying out our no-longer-entirely-effective waterproofs. There was all manner of plastic rubbish, including a lot of bottles, left scattered around the site by shepherds and foresters and we cleared it up as best we could – for our own benefit really. Much of rural Romania gets by without any form of refuse collection, so people compost, burn or reuse most of their waste, but plastic is just dumped and this makes for some ecologically unfriendly rubbish dumps on the outskirts of villages. Sadly, in the mountains also there seems to be little consciousness about protecting the environment from litter and this is very visible on the popular Făgăraş ridge route where several bivouac sites have their own tawdry rubbish dumps. Superhumanly, given how wet it had been, Matt managed to get a fire going and I cooked the first of the week’s tuna fandangos – a tasty amalgam of basmati rice, tinned tuna, sun dried tomatoes and dried wild mushrooms. After dinner we discussed the following day’s itinerary before turning in for the night. In the morning, the weather looked very uncertain with fast moving cloud billowing high above the treetops, but by the time we’d breakfasted and struck camp sizeable chunks of blue sky were making regular appearances. We set off optimistically and by the time we’d climbed the couple of hundred metres to clear the tree line, the weather looked distinctly promising. Furthermore, from our lofty viewpoint above the cloud-filled Făgăraş Depression to the north we were able to enjoy a spectacular cloud inversion. The view of the mountain landscape opening out ahead of us was also spectacular and not a little daunting. We continued on and upwards, zigzagging up to 2200 metres and then contouring just beneath the peaks of Varful Izvorului and Varful Langa. Given that we were each carrying well in excess of 20 kilos, it was great to not be climbing for once, which also made it easier to enjoy the breathtaking views of the main ridge of the Făgăraş to the south and west. We trundled along contentedly in this fashion for a while and then made the short sharp climb to the saddle just east of Varful Zarnei, briefly joining the main Făgăraş ridge path. We perched on the saddle and had some lunch while watching a shepherd with his flock below us to the south. We would encounter shepherds with flocks of several hundred sheep at regular intervals over the following days. 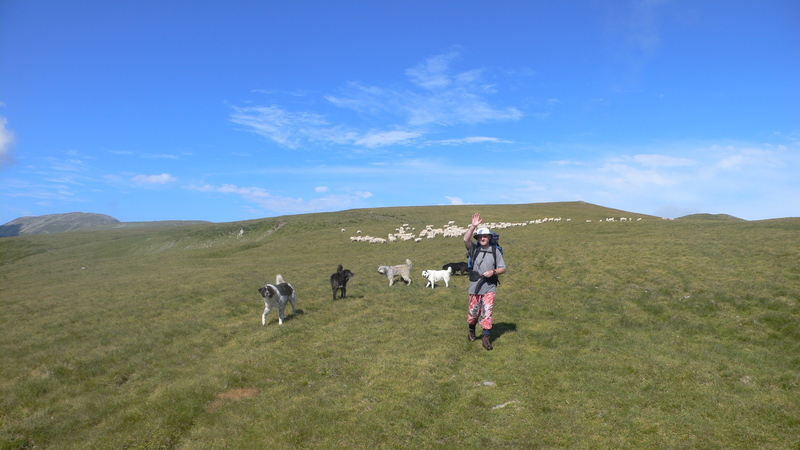 It seems that in the summer months sheep are grazed at high altitude and kept on the move all day, if this is designed to produce top quality meat – it works; I’d recommend Romanian lamb to anyone. After our lunch stop we continued on our way, skirting the summit of Varful Ludişoru before dropping a couple of hundred metres to the Curmătura Ludisor saddle, where we left the main Făgăraş ridge path behind. 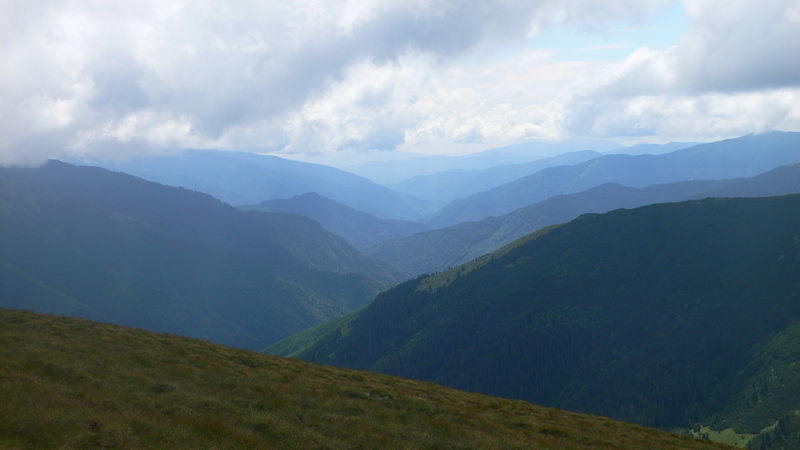 The remarkable view south from the saddle, down the Brătila river valley to the grey-green interleaved mountain ridges beyond, was enhanced by the afternoon light and a slight haze in the distance. Our route took us along the ridge to the east of the valley. 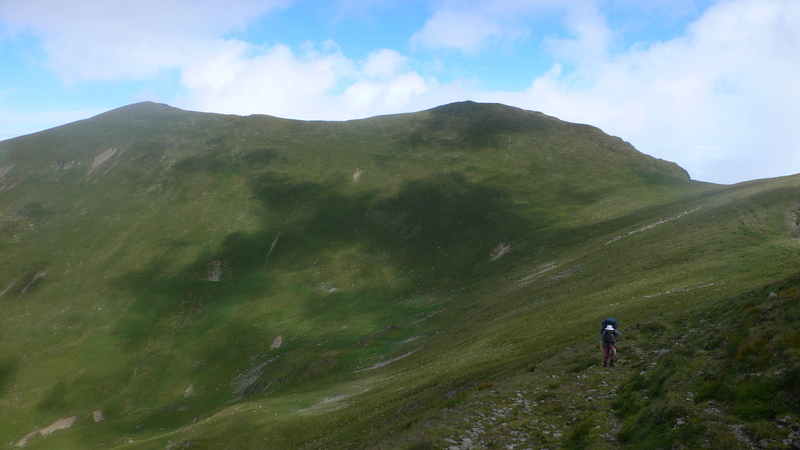 We climbed a little and then contoured along on the fine, meadow-blanketed ridge. Ahead, to our right, we spotted a ramshackle looking shepherds’ hut and could see its occupant milling around outside it. He appeared to have spotted us also and began to make his way up to the path to meet us. The shepherd arrived at the path ahead of us and squatted in attendance. As I drew near to him I removed my sunglasses and greeted him with a ‘bună ziua’. A great, weathered, bear of a man in extremely worn and dirty old clothes, his mouth full of catastrophic gold dentistry, he was probably younger than me though he gave the impression of being more ancient than the rock on which we stood. He took my shamefully soft, feminine little hand in his huge, calloused, labour-hardened paw and blasted me with a cochlea-shattering ‘BUNĂ ZIUA’ in response. One of two things was happening here. Either the man was stone-deaf, having been injured in some form of industrial accident involving a large quantity of dynamite, or he was doing what most Brits do when attempting to communicate to non-English speaking foreigners. Matt speaks a creditable amount of Romanian and once he arrived on the scene we were able to exchange a few pleasantries. All the while, two of his lethally proportioned dogs had circled us and taken up positions from which they would be able to rip out our throats in a matter of seconds, should we raise our hands against their master. At this point, the shepherd produced from his pocket a lighter so ancient and decrepit that were it not for the fact it was largely made of plastic it could have passed as a relic from the 19th century. He ostentatiously demonstrated to us the lighter’s failure to work and clearly intimated that I should hand over a replacement, which I must surely possess, that very minute. The dogs also wore an air of expectancy. Happily I had a couple of spare lighters and rather selfishly handed over the least efficient. The tremulous and malnourished flame ignited a smile that revealed the true magnitude of his dental malaise. He was clearly delighted, kissing his prize passionately. After aurally assaulting us with a suggested itinerary – ‘Varful Roşu, Refugiul Iezer, Păpuşa, Voina’ – he thanked us and scampered off to his hut with the hounds in tow. Continuing on our way we crossed to the eastern side of the ridge and gained a view south towards Varful Roşu and its sister peak, Varful Iezerul Mare, on the Iezerul-Păpuşa ridge, which we planned to climb on our route the following day. Just now, however, some serious-looking weather was gathering along that particular ridge and thunder cracked and rolled out towards us. With the sky darkening, we made haste for an area of lower-lying, level ground and pitched the tent. Shortly after, the weather arrived. Aside from a failed foray in search of water when the rain briefly paused, we were stuck in the tent all evening. Still, we were relatively dry and had enough water for tea and food, so all was well. The following morning it was still raining, but it eased off and finally stopped before the morning was very old. We continued along the ridge, losing a little height then gradually climbing for a few hundred metres. 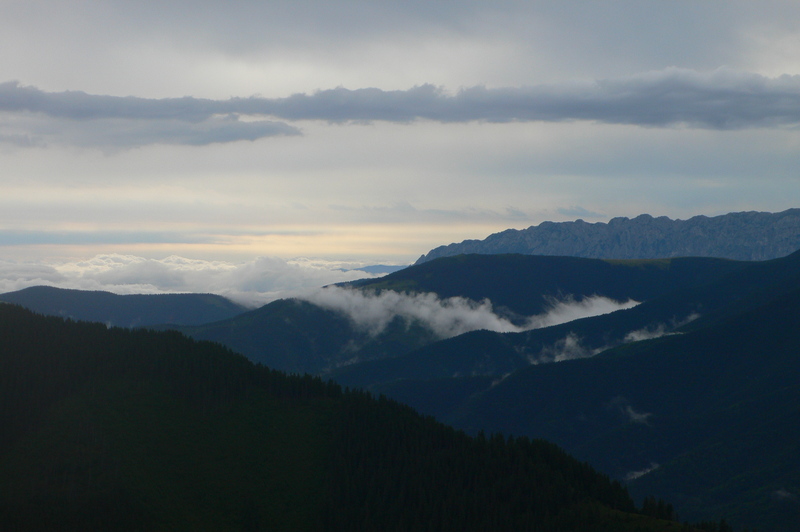 Again we looked down on a cloud inversion shrouding the plain to the north and to our northeast the imposing limestone wall of the Piatra Craiului mountains stood out prow-like above the submerged world. The ridge had become sharper and the narrow path was fringed by long grass, which had our legs and feet soaked in no time. Ragged billows of cloud vapour rolled up the mountainside like slow motion surf and we kept a weather eye on the ever closer bulk of Varful Roşu. After checking our bearings, we zigzagged 100 metres down a rock-lined track. Below us two shepherds marshalled their flock and as soon as their dogs got wind of us, they let off a barrage of recriminations from atop their rocky vantage points. We exchanged waves with the shepherds and the dogs were still barking after we were long gone. Arriving on the Curmătura Oticu saddle we stopped for a lunch break and cast anxious glances at the long, exposed ridge of Varful Roşu, which began to climb southeast from where we sat. Armadas of cloud were moving in every direction across the heavens and it was difficult to know whether they bore malign intent or not. Neither of us fancied being up on an exposed ridge should the previous afternoon’s thunder and lightning be repeated. After much umming and ahhing, we bottled it, reasoning that the option of continuing south from the saddle on a contouring path above the valley would make for a very lovely walk indeed. And it really did, especially as the weather stayed good, which made our trepidation seem a bit pathetic. We coasted around the valley just inside the tree line, crossing a few rather swollen streams, before dropping steeply into a large area of coniferous forest. From a distance we could see denuded, tree stump-studded patches of ground reminiscent of Paul Nash’s paintings of Flanders circa 1917. The two-stroke buzz of chainsaws announced work in progress as we descended a mangled track of glutinous mud and shattered wood. A huge and very shiny red forestry tractor/bulldozer combo stood in the path ahead and we sidled around it offering greetings to the big and tough looking foresters working around it. They were a taciturn bunch, but their unfriendliness was made up for ten minutes later by two chaps who pointed us in the right direction with imprecations of ‘drum bun’ , literally meaning ‘good road’. Our route climbed on a faint path up to an amphitheatre beneath the Curmătura Groapelor saddle to the southeast of Varful Iezerul Mare. 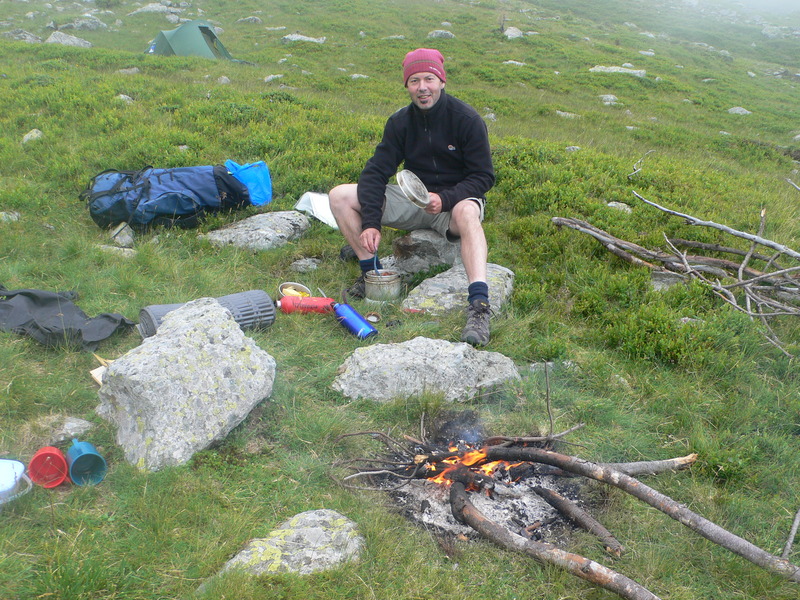 We found a fine bivouacking site on a small plateau at about 1900 metres and set up camp forthwith. 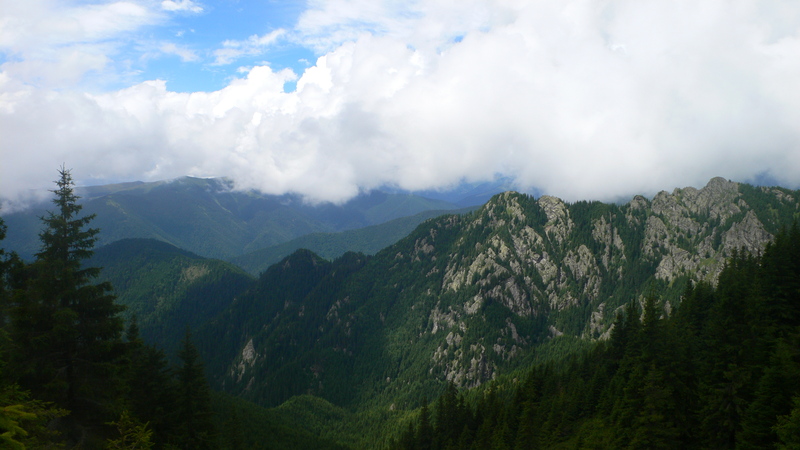 From our vantage point we had commanding views of the mountains to the north and west – including some of the 2400 metre-plus peaks of the Făgăraş chain – and the constantly ebbing and flowing cloudscapes. To one side of our little plateau stood a boulder the size of a brick outhouse; the relatively un-weathered surface on one side of the rock suggested that it had recently arrived here from above, having detached itself from the mountain looming over us. A series of large gouges indicated the route by which this monster had bounced down the mountainside in a Barnes-Wallis-esque fashion. If it had cleared this little plateau it may well have continued all the way down to the valley floor. Matt gathered firewood and I climbed 300 metres to the nearest top in an abortive attempt to send and receive text messages on my phone. On my return, Matt had got a fine blaze going and we had our tuna fandango while gazing at the endlessly compelling view. Before turning in, we decided that if the weather was reasonable the following morning we would climb to the saddle then up along the ridge of Varful Iezerul Mic (2409 metres) before descending to Refugiul Iezer from where we could launch an assault on Varful Iezerul Mare and Varful Roşu. After an excellent night’s sleep we awoke to unsettled weather conditions once again. Our prevaricating tendencies of the previous day returned to haunt us; should we wait to see what the weather would do? Should we take an alternative route? Or should we just go for it? We settled for a few more hours of prevarication in extremely agreeable surroundings, before striking camp and launching ourselves up the mountainside. After a couple of hours of splendid walking with some fine if intermittent views, we had traversed the Iezerul Mic spur and had arrived at the Crucea Ateneului – the confluence of several ridges. Refugiul Iezer was below to our west and we were directly south of Iezerul Mare and Roşu. Buoyed by our rapid ascent of the ridge, Matt was all for heading off across these twin 2460 metre peaks and bivouacking somewhere along the Iezerul-Păpuşa ridge. 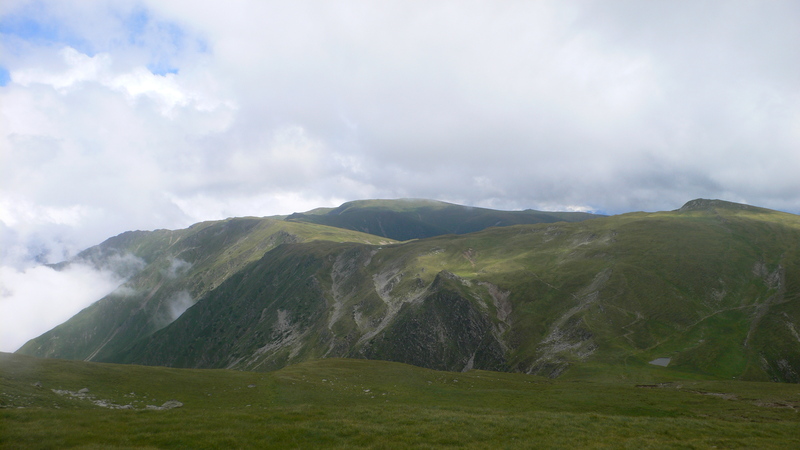 I felt inclined to head for the refuge as it was already mid-afternoon and dark clouds were drawing in, furthermore, we had made good time on the walk thus far and we could think about tackling the Iezerul-Păpuşa ridge the following day. Weather permitting. Matt eventually deferred to my rank cowardice and we descended to the refuge, which sat in a large corrie near a rather lovely alpine lake. As we approached the refuge we noticed the remains of a few campfires dotted around with rubbish – mostly old tins and bottles. 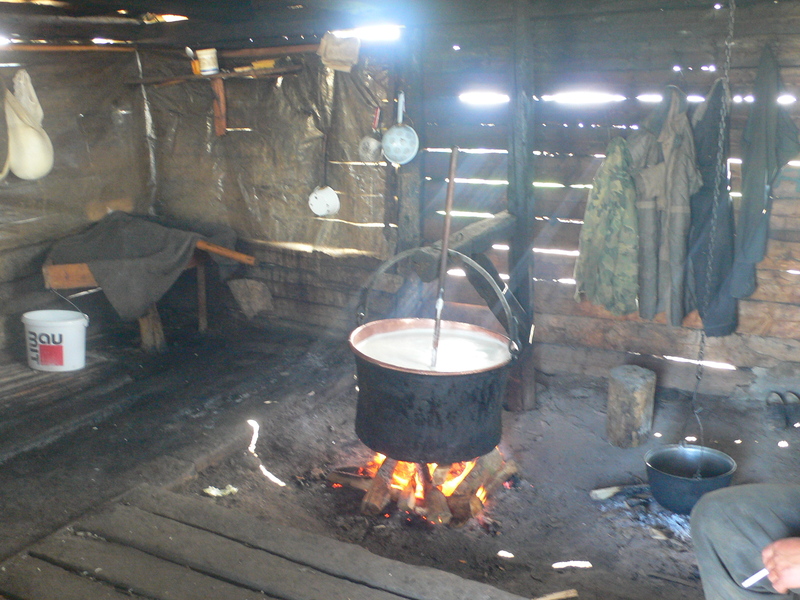 It was the same inside and outside the refuge. We had a good clean up, which helped us feel virtuous and when it started to rain quite heavily I was able to compound my righteousness by adopting a smug posture at having insisted on the refuge option. The refuge itself wasn’t the finest example of the form, but it was dry, had some bunks and was now clean-ish. I set my alarm for 5.45am and we settled down early for the night, hoping for good weather to tackle the ridge in the morning. Dawn arrived with uncertain tidings. 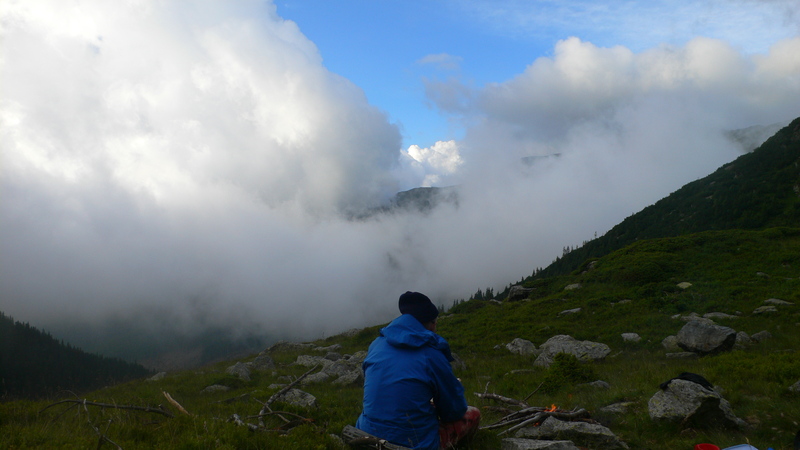 The sky was clear above us, but cloud poured over the Iezerul-Păpuşa ridge to the northwest – exactly where we would be headed. Perhaps detecting a degree of hesitancy on my part, Matt set off at a canter before I could refuse any more fences. 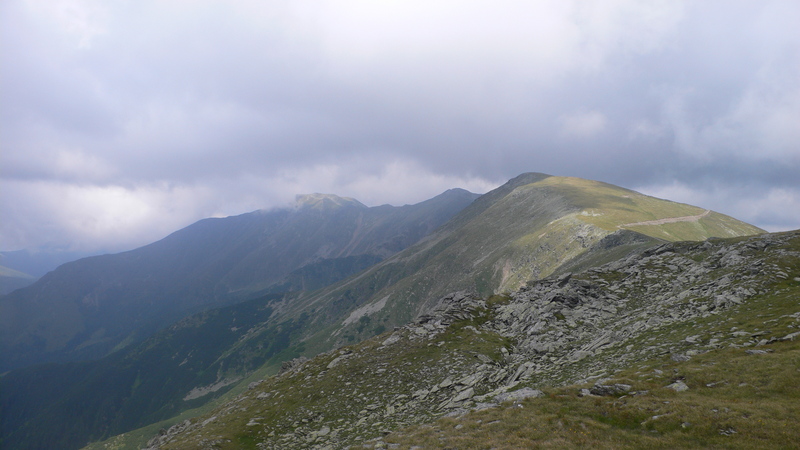 We were soon up on the ridge, skirting just below and west of Iezerul Mare peak. The early morning air was still cool and the valleys beneath us were submerged in monochrome shadow. We gained the summit of Varful Roşu within an hour, though the signpost by the refuge had suggested that it would take an hour and a half. If our progress continued in this fashion then what had seemed a daunting prospect the day before would be much more manageable. From the summit we looked down the mountain’s sharp northwestern spur to the Curmătura Oticu saddle where we’d had our collective crisis of confidence two days before. The ridge certainly looked well ventilated from our present vantage point. We enjoyed the 360° views awhile before descending a little and continuing on our way. Beyond the summit of Varful Roşu we stayed south of the ridge, which dropped precipitously amid sheer rock faces to the north, but which opened out into a broad, meadow-cloaked crest that merely sloped steeply away to the south. This landscape reminded me of the ‘hump-backed, bow-headed’ South Downs of Kipling’s description, only on a considerably larger scale. 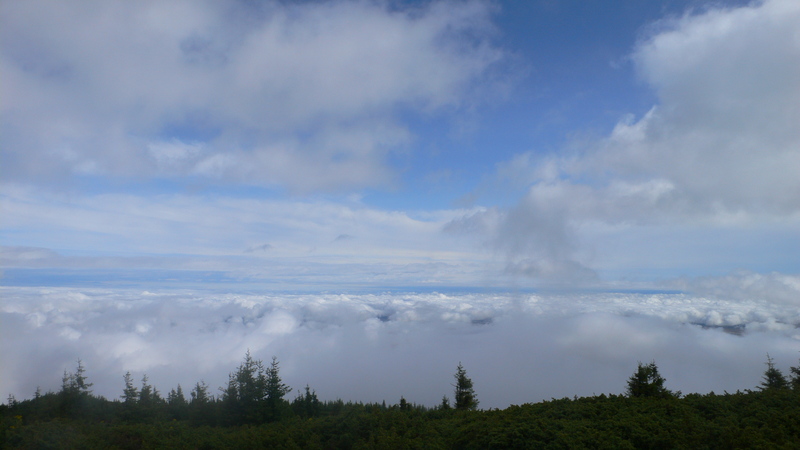 Rough hanks of cloud billowed fitfully over the ridge, but the sun had made an appearance and seemed to be gaining the upper hand. We strode out purposefully, taking in Varful Piscanu (2323 metres), with Varful Bătrâna in the middle distance and the dome-shaped bulk of Păpuşa looming beyond. To the west of Bătrâna we could see a large flock of sheep moving across the hillside like a woolly constellation orbiting in slow motion. As we drew closer, we could pick out the shepherd and his dogs on the fringes of the flock, at which point the dogs also became aware of us and six or seven of them came bounding towards us – all raised hackles, bared fangs and ferocious barking. I swiftly rendered myself invisible and the hounds loped straight past me and surrounded Matt. Before they could rip him limb from limb, however, the shepherd gave them pause with a high-pitched whistle and they seemed content to trot along beside Matt, haranguing him all the while. The shepherd was of a similar age to us – mid-forties – but his weathered countenance made him appear older. In contrast, his blue eyes were as clear as mountain lakes. Like all the shepherds we’ve encountered when walking in Romania in recent years, he was entirely robust and looked as strong as the proverbial ox. 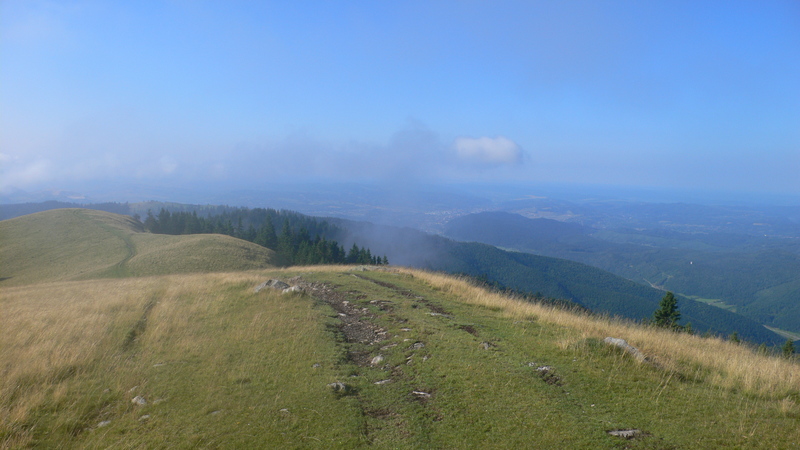 A few greetings exchanged, we continued on our way, up the western flank of Bătrâna and then contouring on a path across the south face of the mountain, which curved round to a spur heading south of the main ridge. Emerging from the lee of the mountain, we corrected our course and strode on westward. We were making very good time and this ridge was an absolute joy to walk: there was very little in the way of up-and-down, the weather had held and the views were sublime. 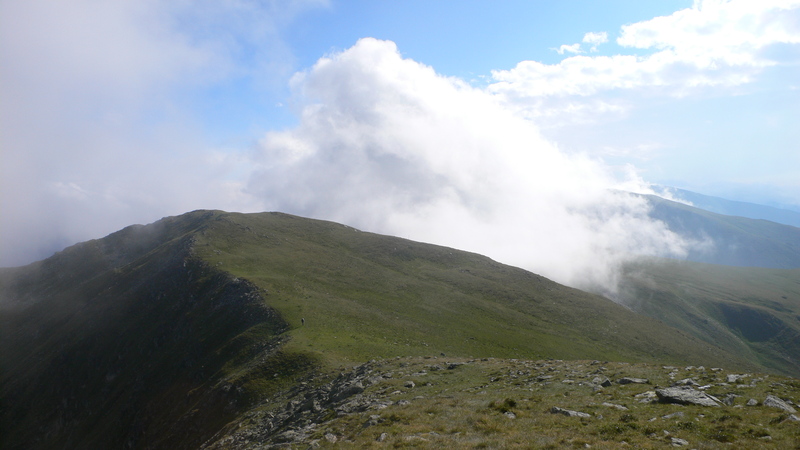 The only cloud on the horizon was the cloud on the horizon, specifically that which was hovering around the flanks of Păpuşa; would we get up and over the mountain before the weather? Păpuşa is only a hundred metres or so higher than the other tops on the ridge, but it just has the look of a weather magnet. 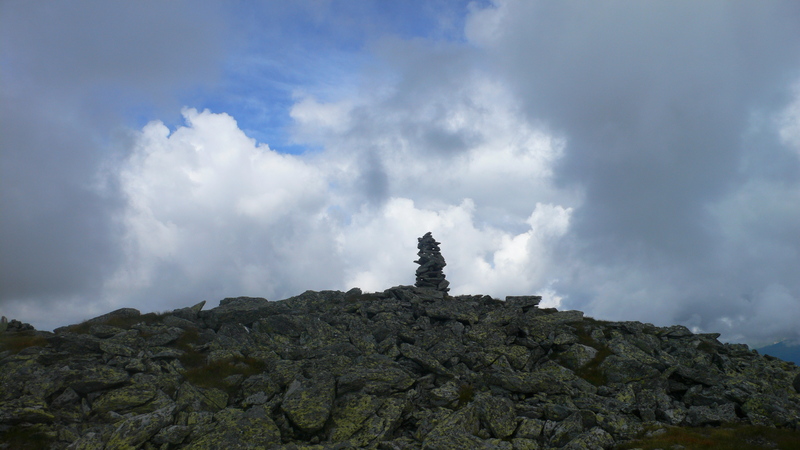 We took in the slight incline to the top of Varful Tamburu (2294 metres) and marvelled at one of the most splendid rock cairns I’ve ever seen – it was two metres tall and constructed in such a way that it had a number of sizeable gaps letting daylight through. Contouring around the top of Tamburu, we could see a heroic shepherd with his flock perched atop Păpuşa seemingly impervious to the clouds menacing the mountain’s flanks. 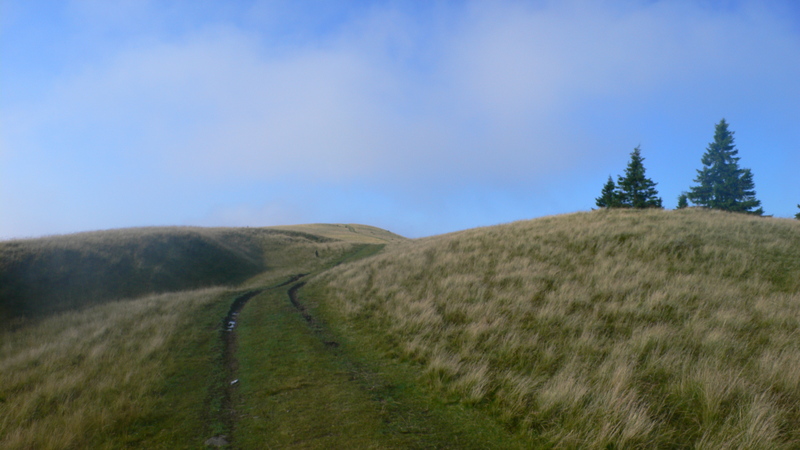 Suddenly, we were confronted by a phenomenon we hadn’t been expecting – other walkers! Two Romanian chaps in walking gear were coming the other way and were at least as surprised as us to encounter a couple of English blokes out in these hills, which are a bit off the radar of international tourism. We swapped notes, wished each other a good walk and continued in our opposite directions. The path dropped us 100 metres into a narrow pass before climbing around to the south face of Păpuşa in a steep but evenly gradiented curve. Some 50 metres beneath the summit our path dropped away to the south, initially in steep zigzags and then following a direct line down the ridge. We descended into cloud cover and rain seemed imminent. At a point where the gradient eased into a gentle slope at about 2000 metres, we stopped for some food and tea, quickly pitching the tent should we need shelter in a hurry – we did, but it was just a shower and we were soon on our way again. We picked up a cart track and coasted gently downhill along the side of a beautiful u-shaped valley where sheep and cattle were grazing. A gap in the green rolling hills on the opposite side of the valley gave a contrasting view over to the vertical limestone wall of the Piatra Craiului. We left the track to continue on the under-used path that cleaved to the side of the valley. Arriving at a grassy knoll, we descended onto the forested ridge that would take us all the way to Câmpulung – our destination for this leg of the walk. Initially, the path through the forest was very pleasant, even when it started raining; after a while, however, we came to a section of the ridge that was being deforested, which was much less enjoyable – and there was also a dearth of camping opportunities. The rain had become quite heavy and we arrived at an area of devastated woodland that looked like it had been napalmed. Looking at the terraced hillsides across the valley, I wouldn’t have been surprised to see a squadron of U.S. ‘Huey’ helicopters flying past to the strains of Ride of the Valkyries. This was no place to camp either and, as we’d been walking for about ten hours, we were both feeling a bit knackered by now. Continuing on, we soon came to a corral where a large number of sheep and cattle were penned; several men were sheltering under a plastic sheet covered lean-to and when we asked them, they told us there was no water until much further down the ridge. We looked at the map and saw that there were several streams indicated running off the ridge; continuing on a few hundred yards, we found a spot tucked into the tree line above a gully where we should be able to find a stream. I pitched the tent and Matt went in search of water. A whole hour later, at the point where I was convinced Matt had fallen to his death, he returned triumphant. We put a brew on. The morning turned out lovely, after a slightly fitful start, and we had a very pleasant walk down into Câmpulung, with great views of the town once we were out of the forest. On our way down, we came to a small hill-station where there were a number of horses tethered and a numerous dogs scampering around. Two men appeared and called us over. 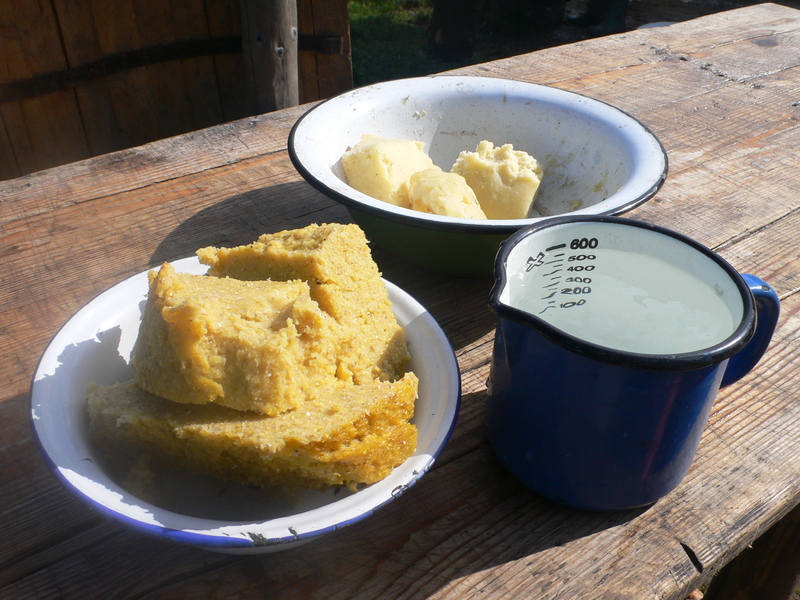 We were sat down on a bench at a rustic table in the yard and served sheep’s cheese and mămăligă, which is made from maize and is like rough polenta. It was wonderful. After we’d eaten, the two men showed us around the wooden huts where they made the cheese employing methods soon to be banned by the EU. The final stretch down to Câmpulung. 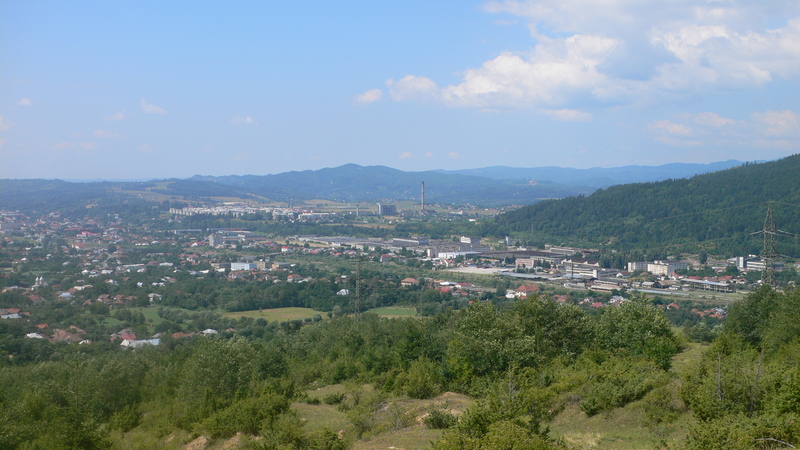 You can make out the huge industrial plant, which was once one of Eastern Europe’s biggest car manufacturing plants. Pete. What would you think of cycling in Romania? Many years ago a friend said it was his number one destination and I think it is quite high on ours. Hope you are getting out. Hello Warren – Have been getting out indeed, in some wildly diverese weather this last week. Post to follow. Romania is a fantastic country to visit whatever you’re doing. I’ve only ever walked there (4 or 5 trips, i think) myself. I think cycling through Romania could potentially be a wonderful – if slightly challenging – experience. In most areas the roads are absolutely pants, though much EU funded infrastructure development has been happening in recent years. I wouldn’t go anywhere near ‘main’ roads as this would be suicidal. The positives come in terms of some wonderful landscapes, particularly in Transylvania and the Carpathians, and in the remarkable culture and often immensely hospitable people. Some rural areas are little changed from the Middle Ages – other than the advent of the motor car. Most people are honest and sincere, though I think you would have to be mindful of security nonetheless; Romania remains a very poor country in many areas. I hope you can involve Romania on your itinerary – I’d love to see what you both think about the country. Any way I can help re Romania, please ask. Warren – There is a big mountain bike scene here and I have a good contact that regularly guides people on trips into the mountains. If you have any questions I will see if I can get the answers for you. That’s a great site you have Paul. Just read the pieces about the transhumance and the shepherd selling the puppies. Really well written, interesting and very informative. Great pics too. I shall look forward to perusing at length. Thanks for your kind words Pete. I feel passionately about the preservation of such a unique way of life and a European ecosystem that most countries aspire to. However, I believe in supporting rather than prescribing as it is not lost on many such countries that we sanitised and wiped out all our own large predators long ago. I am involved with the Transylvanian Wildlife Project http://www.transylvanianwildlifeproject.com/ and working with transhumant shepherds is key to our projects success. These shepherds have more sightings of wolves and bears (wolves often shadow flocks) than even the local wildlife rangers. That is why I believe Scottish hill farmers would benefit in the long term when re-wilding occurs as they could rely on tourism as well as agriculture. They would soon be the focus of a great deal of conservation and wildlife interest and I believe would soon become the true custodians of wild places in the highlands. Working with farmers is key to the success of re-wilding and once they feel some form of ownership in this process they won’t feel so threatened by the reintroduction of wolves. My focus will be on bringing those interested in traditional methods of livestock protection with Transylvanian Transhumant shepherds. We can learn a lot from these guys whose traditional way of life is unfortunately now under threat due to the deluge of EU rules on the manufacture and packaging of sheep cheese, one of the main sources of income for shepherds. Hello Paul, I read a whole lot more on your site last night and ended up going to bed rather late! I thought your piece on Transylvanian Gypsy culture was fascinating, insightful and addresses the issues that affect them and the wider culture without mincing words. You are obviously passionate about rewilding and I do agree that reintroducing the wolf to areas of upland Scotland could be of great benefit. The key is, as you say, persuading farmers to this end. The reintroduction of the sea eagle to western Scotland has, in the long run, been a success and as you say, they have been the subject of a great deal of wildlife and conservation interest. It is estimated that the sea eagles attract around £2M in income from tourism. I believe that many landowners, farmers and local people now see the sea eagles as an asset, though for some sheep farmers they are still regarded as ‘vermin’ because they take the occasional lamb – even though they are compensated for losses. The recent reintroduction of beavers to the Loch Sween area looks like being a success too. Reintroducing wolves would meet a lot of resistance I feel, but nothing is achieved without trying. You’ve sparked my interest Paul, I’ll look into the issue as it stands in Scotland. Thanks again Pete for your comments. The subject of Gypsies is a very controversial one in Romania, and as you will have seen in the headlines the UK and France too. Many Roma are true opportunists but often in ways that society finds intolerable. 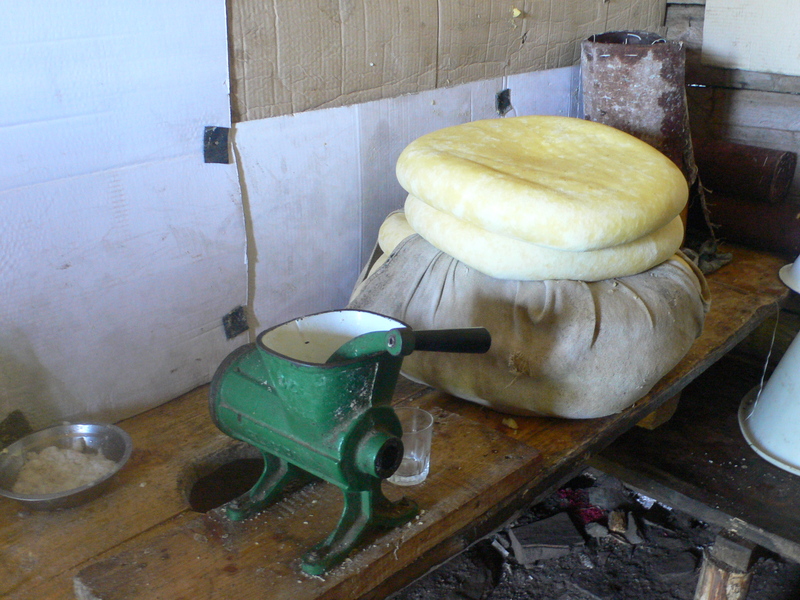 That said I also know many hard working and honest Gypsies that take on multiple jobs to provide for their families. It is very easy to generalise but they are a truly diverse and adaptive people spread over several countries which contains many sub groups, differences in culture, and language. You cannot really say the Roma are like this or that, because you will find an equal number that are not. I prefer to take people at face value which is why I take great pleasure in meeting them and documenting a snapshot in their lives. When we stopped at that funeral wake my girlfriend was truly scared, but nothing negative happened to her and we met some very kind and interesting people. I hope to expand on this page in the near future when I spend more time outside of the Saxon and Szekely lands. If the sea eagle can bring in £2M of tourism revenue, just think what the wolf will bring in! I would envisage a lot of resistance to their re-introduction, but if we are to be taken seriously when it comes to conservation we are going to have to move forward with reforestation and reintroduction of indigenous species. Far too often we are guilty of preaching to other countries about cutting down forests and degrading habitat for animals, when it is blatantly obvious we have already done the same to our own environment! I have heard about the re-introduction of the beaver to Scotland too. Have you seen any or evidence of dams? How such a project could cost £2 million is beyond me and that fact ranks highly on the grievance list of those opposed to the project. Why do we need to control, monitor and observe every movement of these beavers when we already know how important they are in maintaining a healthy and truly ‘wild’ environment. Until 400 years ago they had been resident in Britain and evolving for thousands of years! Why can’t they just leave the beavers alone to get on with what they know best? All this concern about fisheries is a bit of a red herring 🙂 There are beavers all over Scandinavia and other parts of Europe without these concerns. However, those that have accumulated wealth from hunting and fishing have a lot of money to campaign against a really wild Britain if price slightly dents profits. Couldn’t agree more Paul. I remember some years ago when I was visiting Orkney, a woman out walking along a beach with her young son discovered 30 seals that had been shot by someone who didn’t like the competition for the fish stocks. Now that is truly sad, and just goes to show how near impossible it will be to bring back predators. There will be a greater risk of being attacked by an escaped tiger from a zoo compared to that of a reintroduced wolf, but I think my views will outweighed by irrational fear. There is a Cicerone guide to The Mountains of Romania by James Roberts. A fluent Romanian speaker, James married a Romanian woman and lived and worked in Romania for much of each year. 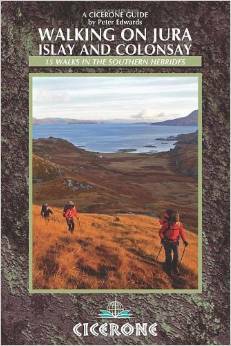 He was in his thirties when sadly he died – before the guide was published. 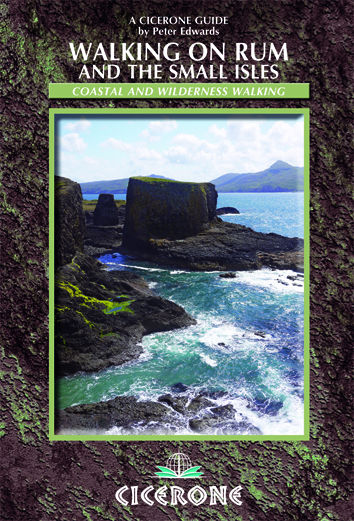 The guide covers all of Romania, but I feel that there’s scope for a more detailed guide to walking in Transylvania especially the Fagaras and environs. Why don’t you write one? You’re ideally placed, your writing is excellent, you have good local knowledge and you appear to be more than capable of pulling something of this order off. Do you speak much Romanian? It’s a lot of hard work and its more a labour of love than an excellent financial proposition. I have a second guide in production and will be starting the research for a third soon. If you’re at all interested, let me know. Thanks Pete. I have not heard of James Roberts, but how sad that he died so young. I live in a Szekely enclave who make up more than 90% of this counties population. Although Romanian is the official language, Hungarian is used more. That said Hungarian is a Finno-Ugric language which is incredibly difficult to learn. I have accumulated a large passive vocabulary, but I still find the Hungarian language a complete mystery! You have probably seen from my site that I am a regular walker with my dog Foxy http://www.trackranger.com/2008/06/walking.html, but all of my walks into wilderness areas have been supported by much stronger and younger 🙂 hikers and walkers from local clubs. I could probably manage a guide book from my knowledge of the eastern Carpathians, but that may be too narrow a subject for such a guide? I could talk with Barna a good friend of mine that knows much more about this subject and has a website that probably contains enough material for such a book already! http://www.naturephotobuilder.blogspot.com/ It is in Hungarian, but if you view his site via google Chrome you will be offered an automatic translation. He is also supporting the Transylvanian Wildlife Project and I have done a small write up containing some of his great photos on the TWP site: http://www.transylvanianwildlifeproject.com/2009/04/support-from-high-alpinist-bereczki.html I also know another knowledgeable hiker/mountain bike guide that spends a lot of his time in the Fagaras. He is also one of the best animal trackers I know, so plenty of local knowledge there. The more I think of it your idea is a good one, so I will speak to these guys then get back to you. Thanks for your comments Pete. I can’t even remember all that I wrote in my previous reply but I will summarise by speaking first to a good friend of mine than has a detailed knowledge walking and hiking in the Carpathians. 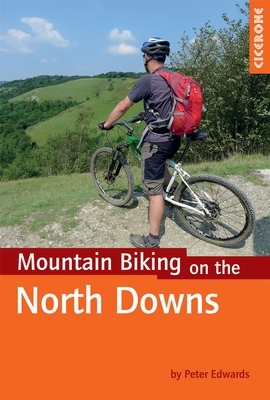 I could probably cope with the writing but my knowledge concentrates more on flora and fauna rather than the trails. I will get back to you after I have spoken with him. Hello Paul, just read your posts about your walks before heading off to work. 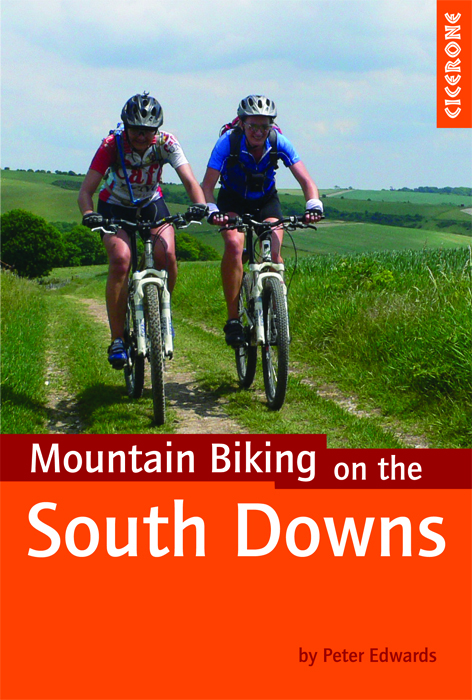 Excellent stuff; it’s great to see a thriving outdoors culture in your area. Foxy appears to be a very game wee dog – great company for walking. After years of an itinerant lifestyle I’ll be taking possession of my first ever dog next month. Being able to post comments on your various posts would be good! I don’t know why you’d be experiencing difficulties posting comments here. It might be worth saving the text and trying again if the problem persists. Foxy was the first stray we picked up but now we have a second called Ginger 🙂 You can’t beat walking with a dog and camping too. Are you going for a cross or pedigree? My sister has a chocolate Labrador by the name of Sol who I’ve taken on many long walks over the last five years and he has just sired some pups. I’m taking one just because Sol has been a great companion on the hills with an excellent temperament. Otherwise I think we would have popped down the SSPCA in Dumbarton and got a 57. Did Ginger arrive by the same means as Foxy? Unfortunately, large numbers of roaming strays is a real issue in Romania. In our area many are picked off in the winter by wolves that venture from the mountains into the valleys in search of food. I am usually to blogging and i actually appreciate your content. The article has actually peaks my interest. I’m going to bookmark your web site and preserve checking for brand new information. 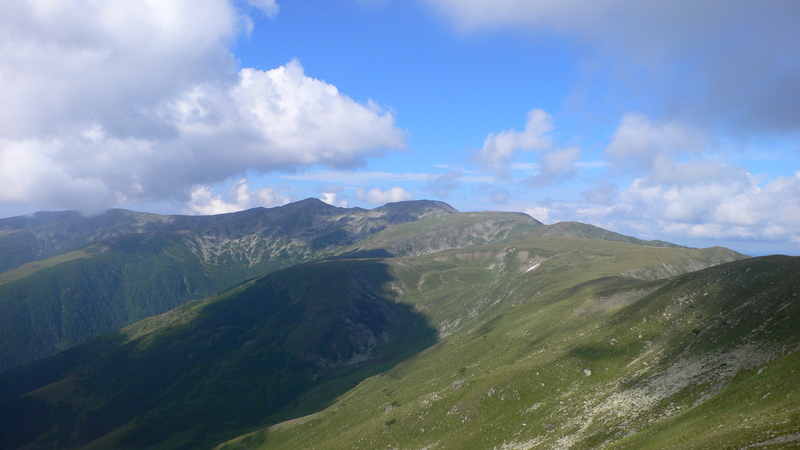 I am very interested a traverse of the Fagaras Range. Your blog posts that cover your travels on the range are great. Guided or not guided is my main question at this point. I’m trying to decide between a guided hike, or simply purchasing the maps, planning the trip, and traversing the range on my own. Any thoughts on that? Personally, I’d go unguided. More freedom and cheaper. Also, the route is well way-marked, so a guide isn’t really necessary.You’ll meet plenty of people along the way – unless you’re planning a winter traverse! Mainly Germans and Czechs, we never encountered any other British people, but that may have changed. There is a route description for the Fagaras traverse in Cicerone’s Mountains of Romania; I think Stanfords might be your best bet for maps. Probably the cheapest/easiest option is to fly to Bucharest, train to Sibiu then train to Turnu Rosu. I’d be interested to know how you get on. Thank you sir. Thinking of maybe August. Yes, I have the Mountains of Romania book – great resource. What about language barriers (English being my native tongue), how much of an issue will that be traveling around Romania/Lodging in Romania on either end of the trip, etc. 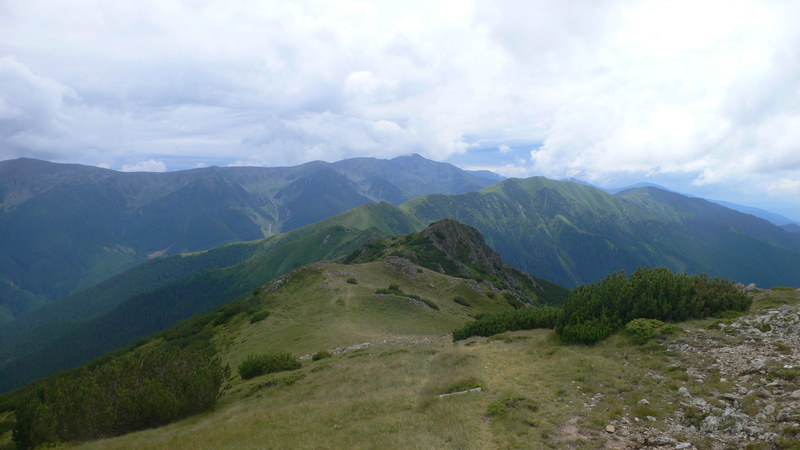 Meteorologically, I think August is the optimum time for walking the Fagaras ridge. English isn’t widely spoken, but people are generally sympathetically disposed to visitors, so will give you the benefit of their patience! As with visiting anywhere non-English speaking, learn a few stock phrases – hello, thank you, how much etc and this will help. A few words of German or French can also be a help. Railway stations, hotels/pensions etc you’ll usually find someone who can speak a bit of English. Good luck, I’m sure you’ll love it. I know there are many high elevation lakes in that area, but just wondered if you ever had trouble locating water along the route? Hello Brian, we didn’t have any problems locating water, but we had a fair amount of wet weather along the way. I think it’s best to aim to camp near a lake at the end of every stage and carry a decent amount, especially if you have dry weather. If possible I’d gather water from inflows rather than outflows. I came across your website through some blogs on hiking in Romania. My wife and I are interested in a 6-9 day hiking trip in Romania probably sometime in June 2017. I’m 59 and my wife is 61, but we’re both in fairly good shape and can hike 15-20 kms. per day, including some rough terrain. Last year we had hiked the Cowal Way in western Scotland, a 91-km trip over 5 days and the year before our family had hiked a 70-80 km. 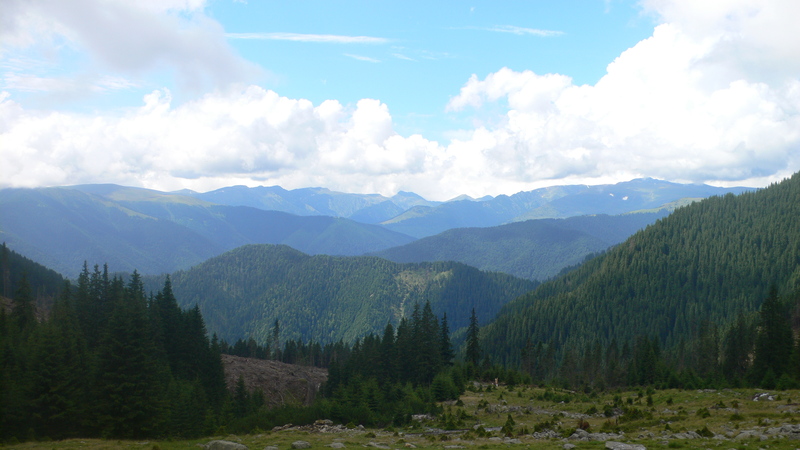 section of the Western Rodopi Mountains in southern Bulgaria. On both those trips, we especially appreciated finding small towns / villages each night along the way where we could find accommodation and food, so that we didn’t have to be burdened with carrying tents, sleeping bags, food, etc. And we loved the opportunity to interact with the local people, even though our interaction was very limited in Bulgaria by the language barrier. So, my question is – can you recommend to us a similar trip that my wife and I could take in Romania that would provide us a good mix of beautiful scenery (mountains / lakes / forests) and small towns spaced 15-20 kms. apart with opportunities to stay at a guesthouse or small pension. We prefer hiking without a guide. Part of the fun is being open to some vulnerability and confusion! Thanks in advance for whatever words of advice, suggestions & guidance you can provide. 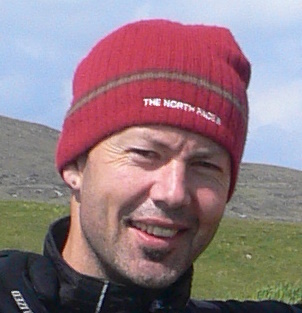 Mark Bauman. I can thoroughly recommend Romania as a wonderful country for walking. 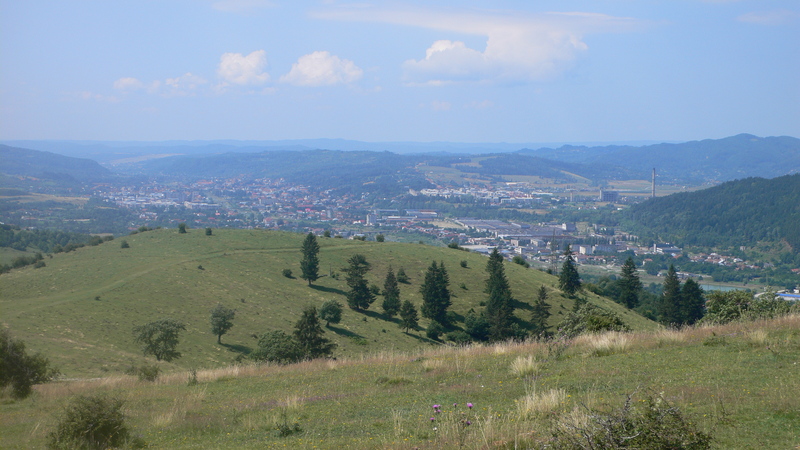 Transylvania and the Carpathians are the standout areas. All of the walking I’ve done in Romania has been backpacking with a mixture of camping and staying in refuges; there is a fairly extensive network of refuges in the mountainous areas – a throwback to the communist era when East Germany put substantial energy and funding into promoting hiking in the country. 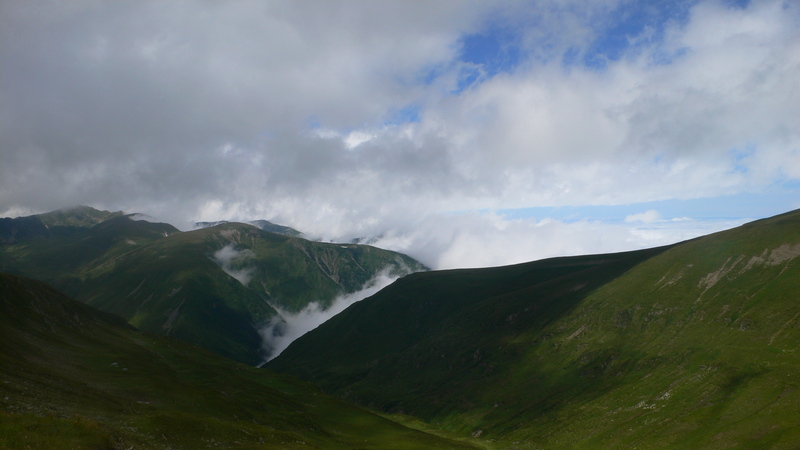 I would recommend planning a route in or around the Fagaras mountains. These are accessed most easily from Sibiu and Brasov, which have good transport links and both are pleasant towns. 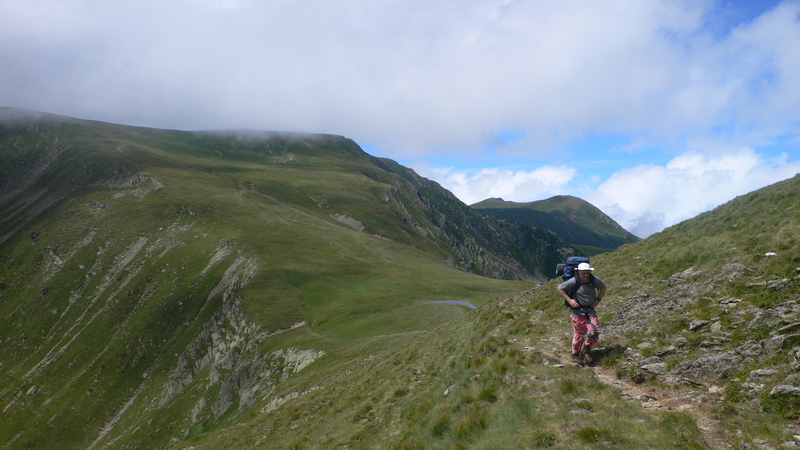 You could perhaps use a mix of refuges and private accommodation if you planned a route to cross the Fagaras Crest or a walk in the foothills. 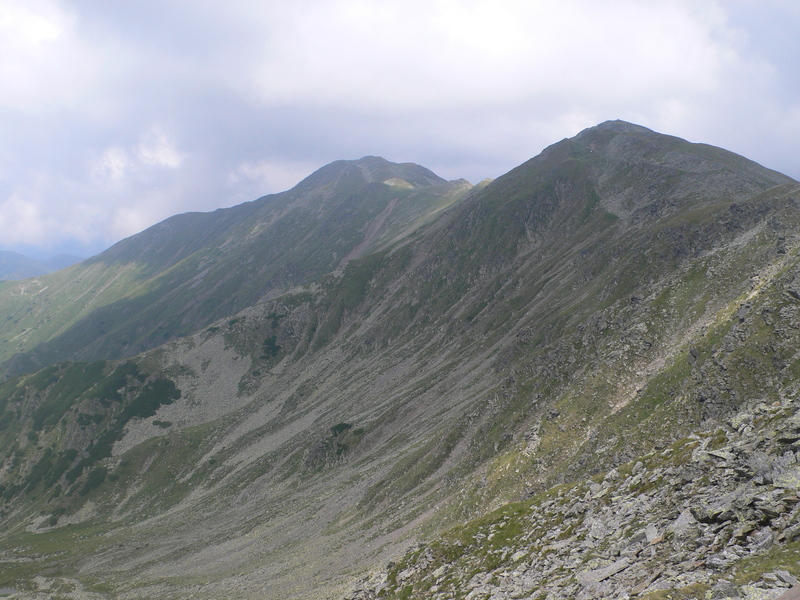 The Fagaras Crest itself is quite tricky in that the refuges are usually some way below the ridge itself requiring significant descent and re-ascent. Cicerone publish a good, comprehensive guidebook, but it will be a bit out of date by now I think as the author, Mark Roberts, died some years ago in Romania while still in his thirties and I don’t think it will have been updated. If you have any other questions I’d be happy to help if I can. I’ve really enjoyed your blog since discovering it whilst planning my trip across the Pyrenees on the HRP, thank you! 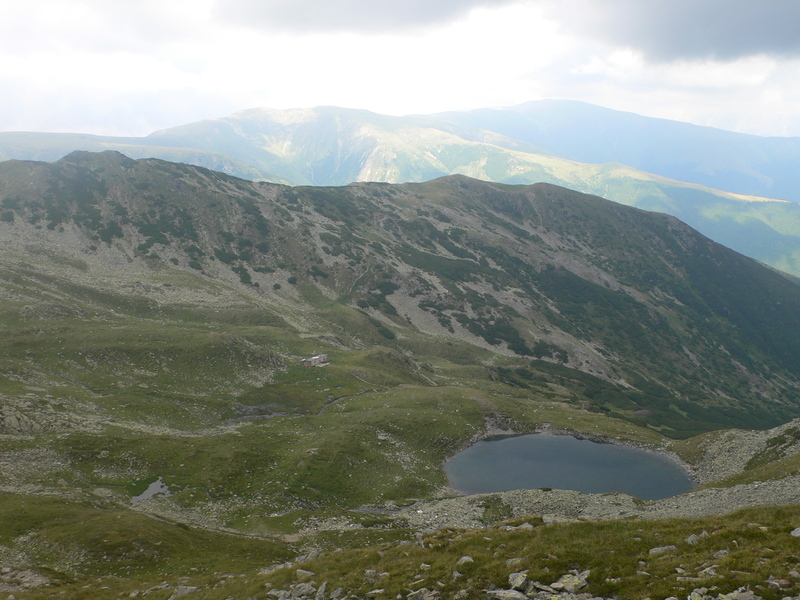 I’m looking at backpacking across the Fagaras ridge this August, and also perhaps in the Retezat mountains. I was wondering if I could fire you a few questions via email? Thanks. And yes, very happy to help.